It begins very simply. With an idea. YOUR idea. It may be that you have a problem that requires a solution – the need for more space for your growing family or a basement that requires finishing for an elderly family member. It may be that you have a want – such as a newly updated kitchen with all the bells and whistles or a tranquil outdoor oasis for entertaining and relaxing. It may be that you have a dream – one that entails an entirely original custom built home, designed and crafted with your specific family in mind. Whatever the reason for your idea, its realization is as simple as picking up the phone. At Highlight Homes, we are with you every step along the way from initial consult to final handshake thanks to our valued standing as designer/builders. While some companies may elect to concentrate their talents in either design or building only, with more than 20 years of structural engineering, architectural design and construction under our workbelts – the talented team at Highlight Homes chooses to specialize in the entire process – taking our innovative designs from concept to reality. When hiring separate architect firms and construction companies, the homeowner must not only spell their idea out more than once and pay for both services – they must also have faith that the builder can interpret and deliver the architect’s plan according to the original vision. When hiring a design-build company like Highlight Homes, architectural design and construction are housed under one roof – making the addition to your existing home or creation of your custom home a seamless and wholly enjoyable process. What is the process behind the Highlight Homes’ Design/Build Method? On-site Visit and Consultation: Shortly following your initial contact with Highlight Homes, one of our talented designer/builders will schedule an appointment to meet at either your home or at the site on which you plan to build your future home. During this visit, we will listen carefully to both your needs and wants – then discuss honestly and openly possible solutions and the timeframes involved, as well as give you an educated guess as to the probable costs. This visit is a terrific time to build a rapport between homeowner and builder – if selected to complete the work, we will be working closely together throughout this exciting process. We are extremely honored to be considered to design and build your renovation or entirely new home. Design Outline and Proposal: After closer examination, Highlight Homes will provide you with a recap of our meeting, an outline of our design ideas, and the cost to move on to the next step – The Design Process itself! Design Process: The homeowner is welcome to be as involved or removed from the process as they like, we want you to be happy! Have fun and enjoy brainstorming ideas with us, or kick back and let the professionals do all the work – it’s up to you! After Signing the Proposal, Highlight Homes Will Create an Original Design based on your requests and/or specifications through a special mix of good old-fashioned creativity, professional experience and the latest technological advances in drafting and architectural design. We will also take “before” photos of the room/site and research zoning for your area. Proposed Design Presentation: Highlight Homes will once again meet with the homeowner to unveil a first draft of the design. If we don’t hit it out of the park the first time, we will take copious notes to make sure we are on the same page during our next meeting. Initial Bid & Construction Contract: Once a design is agreed upon, Highlight Homes will draw up an initial bid based mainly upon a projection of permits, labor costs and materials. Highlight Homes will do everything in our power to work within your timeframe and budget with NO SURPRISES. If you are pleased with our bid, you will then sign a contract with us to begin the THRILLING construction phase! Pre-construction: During this phase, we will secure the necessary permits for you, order materials and make sure we have everything in place for a next to perfect construction phase (needless to say, we can’t control the weather). Site Preparation: Our construction team will work diligently to cover and protect the other rooms of your home, so that nothing is damaged and there is as little disruption to your daily life as possible. We will also carefully plan for the removal/recycle of discarded materials throughout the construction phase. Let the Construction BEGIN! Now you will begin to see your idea really take shape. Construction Phase: While we won’t ask you to pick up a hammer and go to work WITH us during this phase, the lines of communication will remain open throughout the remainder of the project. 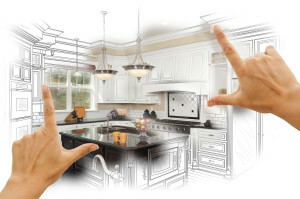 When dealing with a custom home, kitchen remodel or bathroom renovation – you may wish to be involved in the selection of materials, such as appliances, countertops, flooring, lighting and fixtures. If so, we can schedule a series of “field trips” to secure these items together so you can add your own sense of style and taste to the project (we find that this is often the homeowners’ favorite part!) If not, don’t worry – Highlight Homes’ has been heralded for our exquisite taste level. Regular Meetings: Highlight Homes will meet with the homeowner regularly to touch base and gauge your excitement. We are accessible as often as you need us – whenever you wish to discuss your project, a supervisor will be right there on-site or the owner of Highlight Homes is just a phone call away! Change Orders: If after one of our meetings, we agree that a change needs to be made to the project – it will be documented in a change order and may affect the pricing. Your Idea Brought to Life: Once construction has been completed, the space will be professionally cleaned and photographed. It is our hope that we not only met your vision, but surpassed it! Tears and cheers are not uncommon at this point. Follow-up: Highlight Homes extends a one-year warranty on home renovations and a “2-10” warranty on custom homes. We will complete a punch list with you before we leave you to enjoy your unique new space with your family for years to come. If you are happy with your home renovation or custom home (and we are confident that you will be), we ask that you help us spread the word about Highlight Homes to your friends, family, neighbors and colleagues! We will be in touch periodically over the years by phone and mailings. We want you to know how much we appreciate the fact that you selected Highlight Homes to complete such an important job – the creation or enhancement of your family’s home.